Rangers SS Elvis Andrus is not in the lineup today, having been scratched with "Silly Non-Baseball-Related Malady." It's very common, especially in spring training. This particular incidence took the form of muscle soreness, caused by a giant tattoo. 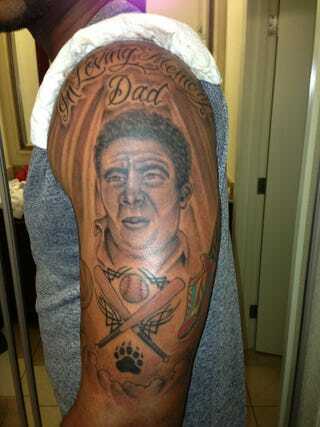 Andrus took advantage of yesterday's off day to get this ink done, a tribute to his late father. (Or as one reader decided, Venezuelan Dan Marino. I sort of see old Pelé.) A piece like that takes hours to complete, and Andrus's bicep was apparently a little tender this morning. "Elvis has been working hard, and having another off day isn't going to hurt him," Rangers manager Ron Washington said. "He'll be ready tomorrow."